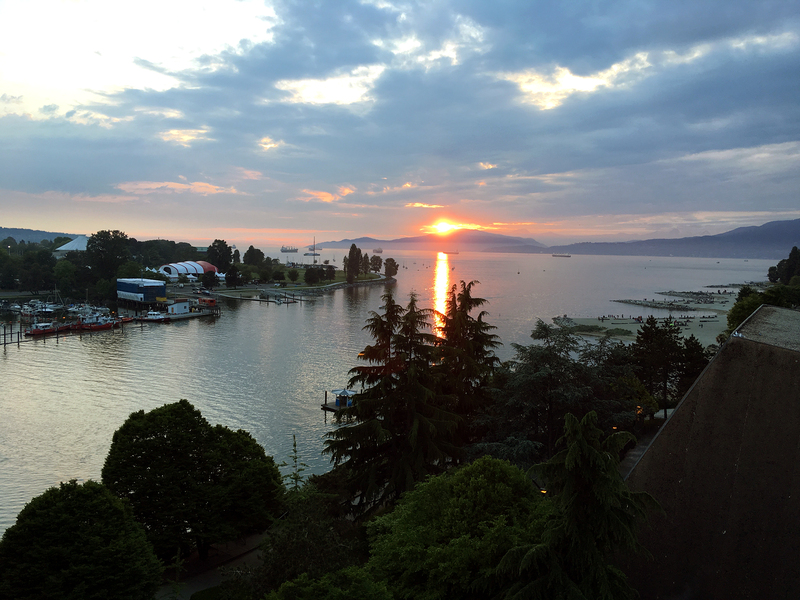 We clocked in some major city miles in Vancouver before heading away from the coast and toward Hope, British Columbia. Check out some of our stealth camping tips so you and your van can live that big city dream! Sailing into Horseshoe Bay on a warm May evening made for a pretty spectacular welcome back onto mainland BC. 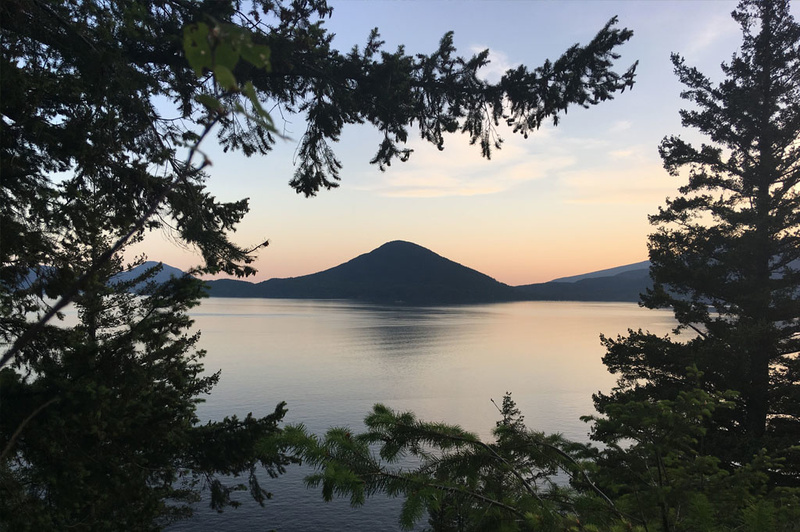 All of the smaller islands surrounding Vancouver Island and the luxurious shacks that sit atop them sparkled in the setting sun as our ferry docked about 15 minutes north of West Van. 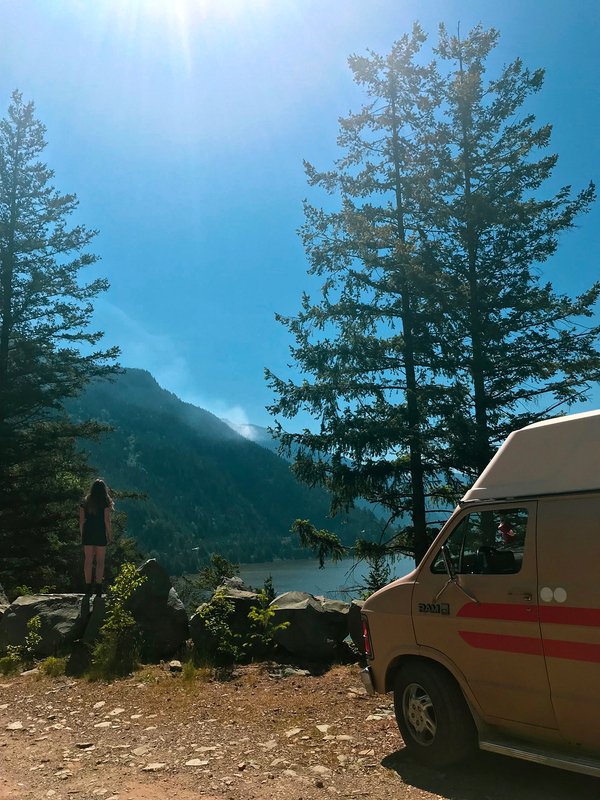 We didn’t want to deal with driving through the city after a long day cruising across the island so we headed north toward Squamish to hunker down for the night. 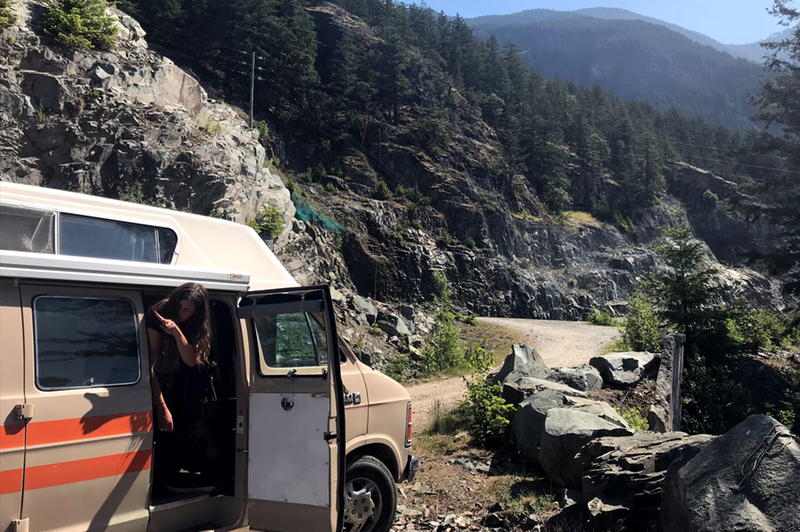 Highway 99, or the Sea-to-Sky Highway, is kind of like a continuation of America’s Pacific Coast Highway that skims the rugged coastline all the way to Squamish before surrounding you in mountains as you head into Whistler. BC is full of scenic drives but this route in particular is pretty special. We found a spot just off the highway with a glorious view of the islands (think Canada, not Galapagos) and the seemingly calm waters that separated us. Being so close to Vancouver, this was a fairly popular spot to camp with a small “village” of vanners forming as more people set up shop for the night. We’re not big fans of waking up early so luckily most of the folks had already set out for the day by the time we rolled out of bed and we had the views all to ourselves. Arrive after the sun goes down and already be ready for bed. This way, you don’t need to exit the van to go to the bathroom or have lights on to see your toothbrush. We like to stay in a public parking lot, like a grocery store or city park, and do all of our bedtime duties there so we can keep pretty low-key once we arrive at our spot. With this method, we’ll head out in the AM so folks might not have even noticed we were there at all. Otherwise, park the van in the day, put all the curtains down and leave. Leave for the whole day. People seem to be much less sketched out by a van in the daytime that seems to just be “forgotten” by nightfall. Nothing says CIA like a cargo van with a fake florist company’s logo rolling up at 7PM and not moving. In Key West, we parked near a hotel and left for the day to be tourists and didn’t return until after midnight – this made the van seem more like any other commuter vehicle than our house. Don’t let anyone see you enter/exit the vehicle. In line with previous points, you either leave for the day and don’t return until people go to bed or you arrive when people are already in bed. Don’t make it seem like your van is your home base and that you’re quite obviously living out of your vehicle. If possible, opt for a spot that’s not directly in front of a single-family home. We like to park in front of apartment buildings or be across the street from churches or businesses so it seems like it could be anyone’s vehicle. Are the folks in unit 2A having visitors? Who knows? Also, who cares? By the time anyone actually pursues it, you’ll be gone. Finally the obvious ones: Don’t make excessive noise. Use minimal lights. Make sure people can’t see your stuff when you’re gone for the day but make sure that what people can see is clean and tidy. Essentially, fly under the radar the best you can. No need to draw any extra attention to your rig or become the eyesore of a neighbourhood with take-out containers and receipts filling the dash. Also, decreasing the likelihood of getting broken into is always the name of the game so don’t have anything worthwhile visible – we even make it a point to not leave spare change on the front console. The time finally came where we were sick of the city and desperately wanted to be back in the woods. We left the sky-high Vancouver gas prices behind and drove past Chilliwack to Hope, BC where we found ourselves a spot on the Skagit River. Given the season, the rivers were quite high as the snow from the mountains was in prime melting time but this had to be the fastest moving river I’ve ever seen. It looked like someone put this river on fast-forward and just left it. Anyway, it felt good to be back in nature until we took a look around the campsite and it was covered in trash. 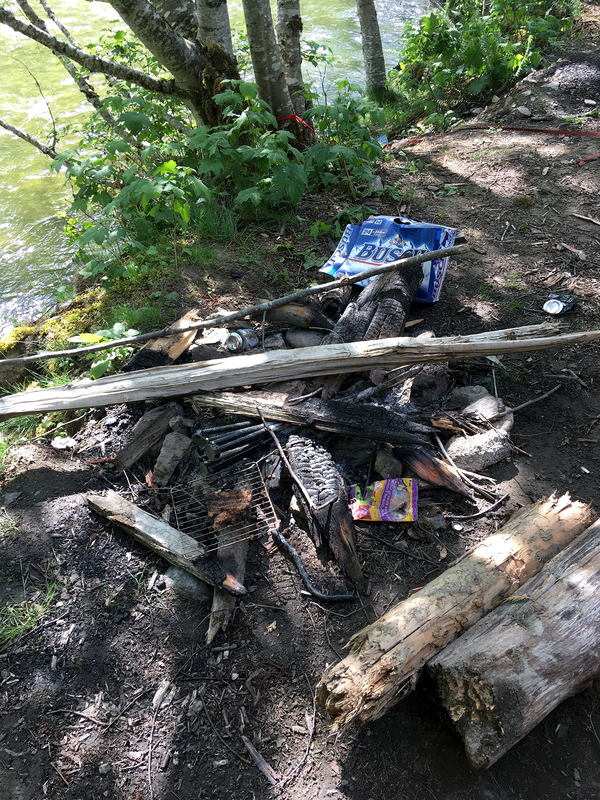 California was bad for litterbugs but this was downright disgusting – the previous campers had attempted to burn all their unneeded camping gear so the fire pit had an ashy camping chair in it while wrappers and beer boxes were scattered throughout. The kicker though, was that they left two chicken cutlets on a cooking grill on the fire pit. You don’t need to be all that “bear aware” to know that that’s not a good idea – ever. So we cleaned it all up and finished their botched burning job to leave the spot as a campsite instead of a pigsty. Then became a great riverside spot! Coastal BC has been amazing so we’re stoked to head into the mountains and start exploring the interior. 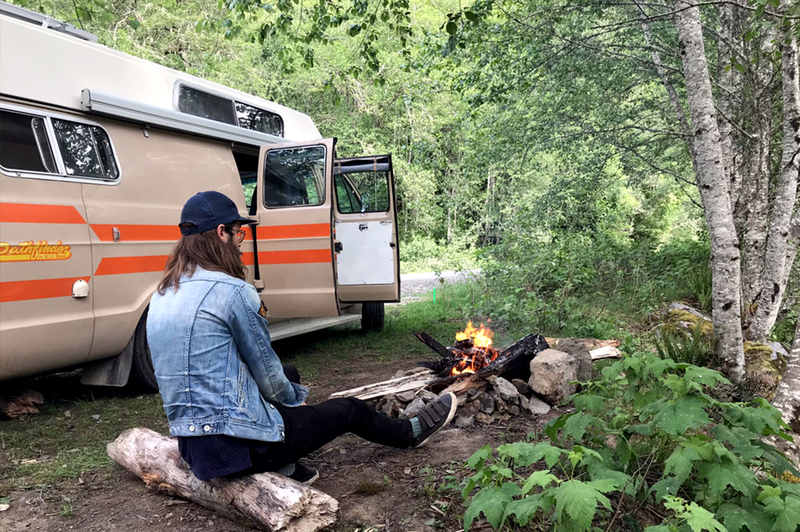 Summer is upon us and Canada is full of what we call Crown Land (similar to BLM lands in the States) so we’re gearing up for a few months of amazing free camping. Follow along on our new Camping Directory where we’ll continuously share all the hidden gems we uncover. Shoot us a message or leave a comment with any must-see spots anywhere from BC to Newfoundland – we’re doing it all!